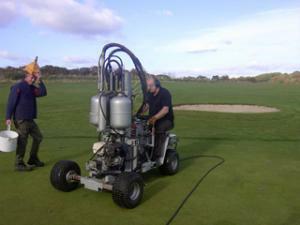 Torrential rain following the early autumn dry spell has highlighted compaction and drainage problems on golf courses throughout the UK, sending Terrain Aeration from Hampshire to Birmingham and Hertfordshire to Eastern Scotland. Copt Heath golf course near Birmingham and Basingstoke golf course near Reading both have traditional, push-up greens, clay lined to retain water. 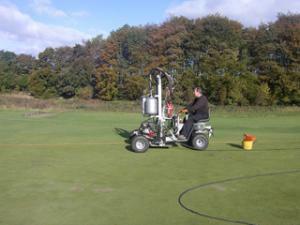 Terrain Aeration treated all 18 greens with the company's Airforce Scamper terralift machine, inserting the probe one metre down through the clay, and relieving compaction panning by injecting compressed air. The newly created fractures and fissures rising from one metre depth to the surface have been kept open by dried, milled seaweed (which swells when wet) injected on the final air blast. Thus, as Terrain's MD David Green says the greens enjoy better drainage with golf balls now bouncing rather than landing with a thump and a splurge and sticking half way into the turf. Kevin Clue, Head Greenkeeper at Petersfield golf course in Hampshire blames the compaction on his tees on heavy machinery used when the parkland course was constructed in 1995. "We've got a compaction problem about 2ft. down," he says. "Terrain Aeration treated the 14th and the 8th before the weather got so bad that they had to stop. I've seen a definite improvement, especially with the 14th which was evident as quickly as the following day. It's drier and much firmer under foot. We're getting the company back to finish the work as soon as conditions improve." Luckily, Terrain got to Kirkcaldy golf course in Eastern Scotland in October and treated nine of Head Greenkeeper Mike Ewan's traditional greens while the weather held. "This course is over 100 years old and we've suffered with surface water at this time of year for many years," he says. David Green remembers rock hard ground conditions. "We gave Scamper's JCB hammer a good work out inserting the probe,"he confides, while Mike Ewan says that on various greens they met rock half way down before getting through the clay lining. Since then he reports above average rainfall in November. "It's rained most days of the month although we've had nothing like the disaster they've had in Cumbria," he says. "Before treatment the greens were severely compacted and although we may have had to shut for the odd day the one-metre deep aeration has made a big difference, without a doubt."